For several years Elaine has been telling stories to children in schools, literacy events, churches and libraries. A few years ago she began writing about her travels, her mischievous dog, Ben Nevis, and her own childhood to keep in touch with her grandchildren. Two of Elaine's books, popular history, When Canada Joined Cape Breton: Celebrating Fifty Years of the Canso Causeway and Christmas in the Maritimes, a book that went into its third printing before its official launch on November 24, 2006, have made the best selling list. Her first book, Remembering Honey, a children's picture book which discusses the difficult topic of grief, was the winner of the Marianna Dempster Award in 2000. She writes a column for the Kings County Record, has experience in self-publishing, reading for and contributing to Chicken Soup for the Volunteer's Soul and writing non-fiction articles for magazines such as: FACES Magazine, Saltscapes, New Brunswick Reader, The Canadian Gideon and Catherine magazines. She has also written and performed a radio documentary for CBC's Out Front and First Person Singular. In the classroom, Elaine conducts workshops on writing techniques and the writing process. In the younger grades she uses a power point demonstration to illustrate the various stages her book Remembering Honey went through, from scrap paper scribbles to the finished product. Other topics for upper grades include: story structure, researching an article and preparing a manuscript for market. 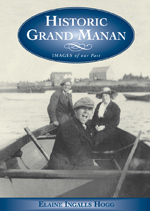 Her latest book, Historic Grand Manan, a pictorial history about the island of her birth was launched on May 8, 2007. The book is part of Nimbus Publishing's popular "Images of Our Past" series. Historic Grand Manan is a pictoral history of this beautiful island in the Bay of Fundy. Published by Nimbus, Spring 2007. When Canada Joined Cape Breton. Nimbus Publishing, 2005. ISBN 1-55109-514-9. "Little Changes". Story included in the Chicken Soup for the Volunteer's Soul. Who Are You Sarah. CBC Radio documentary for Out Front, 2002. Remembering Honey. Nimbus Publishing, 2000. ISBN 1-555109-3367. Resource Links gave Remembering Honey an "E" for Excellent, and placed the book on the Best Picture Book List for 2000. "There was the point where being totally naïve about how to become an author came in handy. Back then I thought all I had to do next was contact a publisher; they would assign an editor to make sure my spelling was correct and voila, I would be a real author with a book. I had a lot to learn. "My childhood dream was put on the back burner until my grandchildren and others encouraged me to write. Since my journey started four years ago, I have self published one book, Grandma Loves You, had several stories published in magazines, newspapers, inspirational sites, done a short story reading and a radio documentary for CBC Radio, been on the review team for Chicken Soup for the Volunteer's Soul working with co-author Tom Lagana and have stories in More God Allows U Turns, Essence Christmas Treasury and in Chicken Soup for the Volunteer's Soul in July. My best known accomplishment to date, is my award winning children's book, Remembering Honey, (NIMBUS Publishing) written to help parents and teachers talk to young children about the death of a pet or someone they have loved. It was a private dream and I'd had it since childhood. Over the years several friends encouraged me to pursue it. Their words watered the seed, dormant for so many years but there were still a number of obstacles to overcome. Perhaps the main one was my lack of conviction that the dream was really attainable. I had no trouble encouraging my friends to believe their dreams would come true but I did have a problem believing in mine. When the lights were off at night and I lay listening to the darkness, I'd think about my dream. I wanted to be an author. Alone with my thoughts, I'd think about the kind of story I'd write someday but when morning came, the duties of the day pushed aside those thoughts and nothing appeared on paper. One morning I was thinking about how I had always enjoyed telling stories to children. Thats what I should do, write stories and tell them to children. Your own children are adults and you havent told stories for years, my inner voice reminded me. But this time I didnt listen for long. Before my feet touched the floor, I made my decision, "I'll never know until I try," and I set out to do just that. About this time I made a visit my grandchildren. When I went to leave them after tucking them in for the night, they asked me to put on their tape. It was then I discovered the tape they listened to every night before going to sleep was Grandma Loves You, a story I had written for them. In the morning, the oldest grandchild told me she needed more stories. So that night I sat up late and wrote a story about my mischievous dog, Ben Nevis. Now it was time to try the stories out on a wider audience so I volunteered to do a story day at the local library. When I was introduced at the library two weeks later, I can't say that I was prepared for the sea of fifty-six little faces milling about before me. "There's such a wide gap in their ages! How will I keep them entertained?" the thoughts ran through my mind. Well, you don't have time to figure it out, If you don't start now they'll be climbing the bookshelves. I took a big breath and began. Aidan Alexander had one wish. When he woke up in the morning he said, "I wish," but his mother said, "Shhh! I know what you are wishing and you can't have it! But Aidan Alexander wished his wish every morning. He wished his wish when he went to school and he wished his wish when he went to bed at night. Aidan Alexander said, "I wish I had a real live wiggly puppy." The room became quiet. I had their attention and for the next hour I told stories. The children smiled when Aidan brought home a fluffy white dog named Ben Nevis for a visit. They held their breath when Ben chased the cat and knocked over Mrs. Alexander's plant. They laughed at the white dog with one ear up and one ear down wearing green plants and brown mud in his fur and they gasped when Mrs. Alexander scolded him and told Aidan she didn't want a messy dog in her clean house. To me, the hour was like magic. Being totally naïve about how to become an author came in handy. Back then I thought all I had to do next was contact a publisher; they would assign an editor to make sure my spelling was correct and viola, I would be a real author with a book. I had a lot to learn. The first lesson came when a rather abrupt publisher told me they had more to do than theyd ever get done and I wasn't to bother them again. Oooh! Ill try someone else. The next person was kind enough to offer to look at the story and sent back a few words of guidance and encouragement, but they too were busy. In the meantime, there had been a second invitation to visit the local library and a two-page spread in our local paper, as well as invitations to tell stories in local classrooms. But still no publisher wanting my words and definitely no book. After some reflection on the events to this point I decided to publish a book myself. Living in a rural area and having no prior experience in writing in publishing, the mistakes compounded. I wasn't fully aware of my resources. God bless my library and local bookstore but at that time I hadn't met any other authors; I wasn't aware of the various Writer's Federations; the self-publishing societies and was totally Internet challenged. But I had a dream and I had promised myself to pursue it, so I did. Being inexperienced in the field, I continued to make mistakes. My biggest was when I trusted a printer to know how to publish a book and didn't get everything he promised written down on paper and signed. (I stood up to him and eventually did receive satisfaction and my 500 books are sold out of their first printing.) Another mistake was not being prepared for the fact that most bookstores want a 40% mark up plus the right to return any copies not purchased. These oversights and others, such as having no marketing plan in place, was a clear recipe for disaster. However, sometimes the truly naïve are protected and I believe that I was in that category. The very day my self-published book came back from the publisher was the day that CBC radio had arranged to come for an interview and a taping of a story time I was giving for the local Historical Society. This publicity, support from family, friends, the local library, several small schools in the out lying areas, our bookstore, local papers and radio all made links that formed the chain of events that lead me to take the next step. When I look back over the past four years, I have to admit my first dream has already come true and now there is a new dream. For I have had various articles published in books and magazines and a publisher accepted and published my second book to help parents talk to their children when death visits their home. But like my brother said, when I was dreaming, someone forgot to tell me that once you accomplish one dream, someone moves the goal posts. Today, four years later I still have a dream; to have another book published, to finish my novel, and to tell more stories to children.